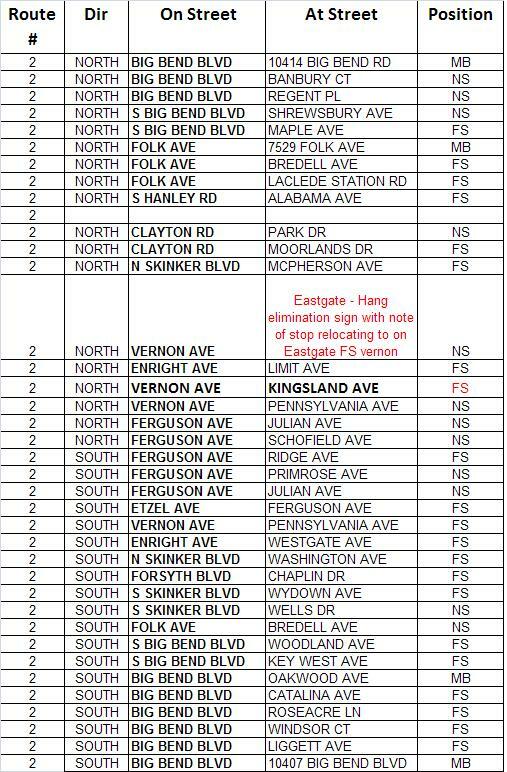 These stops are being proposed for elimination as part of Metro’s Bus Stop Evaluation Program to make the system more efficient and faster. Please submit your comments for the #2 and #80 by Monday, September 19, 2011. Please submit your comments for the #59 and #95 by Tuesday, September 6, 2011. If you have any questions or comments, please leave them below and we will provide an answer from the planning department. Remember, the routes are not up for elimination, and bus stops are evaluated if they do not meet Metro’s service standards, described in a previous NextStop post. Thank you for all your feedback throughout this process. Thanks for the feedback Brian! I will pass the comment along to planning. Brentwood promenade cause were can’t get to target without it. Jason, we appreciate your input. We will give your comments to the planning department. What problems are you having with the Mackind bus Kathy? 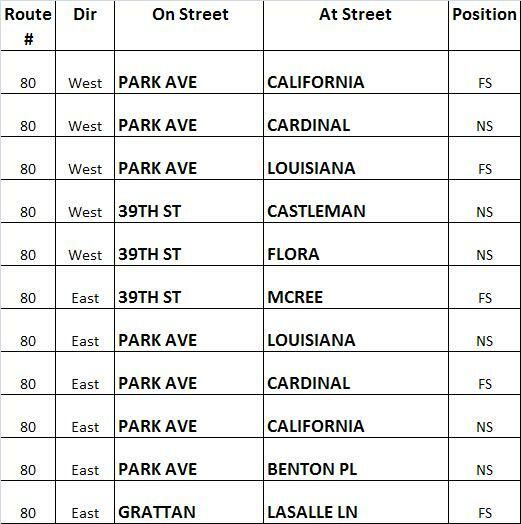 We are not removing any of the routes, just evaluating a small percentage of the stops. Where is your home and when did you notice the problems? Kathy: It sounds like the route near your home may have been one those eliminated. When about 35% of the bus system was cut, thousands of commuters had absolutely no public transit options. Our commitment at Metro was to return the system to its original 500 square mile coverage area. We also promised to address the complaints about “empty” buses and make the best possible use of the resources we have. In the service restoration, resources used for bus routes with low ridership were moved to create or improve routes with greater demand. If you call our customer service department, we can help you find an alternate bus route. The number in Missouri is 314-231-2345 and in Illinois, the number to call is 618-271-2345. You can talk to someone from 7:30 a.m. to 4:30 p.m. Monday through Friday. Kathy: A little more information for you from our planning department. When we were returning service to the system, we made a decision not to serve Macklind because of low ridership. This area is less than a half mile from several alternative routes you may consider using: #10 Gravois Lindell, #11 Chippewa, #90 Hampton, and #95 Kingshighway. The stop at Big Bend and Elm is something that needs to be looked at. Plus bus patrons wanting to shop at the Schnucks grocery store there need to have westbound buses pull onto the store lot. Big Bend is like pulling teeth trying to cross it at the store. Kathy, The #14 Garden line does run on Mackland between Shaw and Arsenal. So all is not lost. Now if a route turns in low ridership, then Metro has no choice but to scrap the service. Now what we really need to do is to get area businesses to mention some pro-transit on their websites mentioning bus and/or rail routes that serves them to help keep each line alive. Now what I find is stupid is the routing the bus passengers on the #49 and the #66 to a poorly climate controlled bus port when they could have remained with pulling onto the bus port. The airport states it’s because of 9/11. I say that’s rubbish. They are allowing chartered heavy motorcoaches onto the departure service road and those chartered buses are full of RICH people and not the poor. Courtney, you have my authority to push the planning people to get both the #66 and the #49 onto the airport arriving flights service road. Now I know that the bus does serve Schnucks in U. City, and it does pull onto one of their lots, but the one in Webster near Jackson and Big Bend Blvd. for westbound on Big Bend, that one does need to be looked at. It’s between Elm and Jacksop. There is grocery store directly accross the street from it. I am spreading word out about the service to Webster University students about the line, and if they need to go to Schnucks on Big Bend and Elm, they need much better service. Westbound buses NEEDS to turn onto the lot so that the public can get to the store safely. Plus the line going onto the store lot would help senior citizens as well.